The Euro-Japanese mission BepiColombo has just successfully started up its ionic engines, the most powerful to have been deployed in space. This first ignition follows a period of intensive testing that demonstrated that the four engines used by the propulsion module work very well. They will allow BepiColombo to reach the planet Mercury after seven long years of travel. Even at full power, each of these engines provides a thrust roughly equivalent to the strength you feel if you put a battery in your hand. The interest of ionic propulsion is not its power, it is its extreme efficiency. With the same amount of propellant, ion propulsion is able to provide much more acceleration than a chemical rocket. It just needs a lot more time. During the various propulsive phases of the mission, the BepiColombo engines will be able to operate continuously for several months. The launch of the BepiColombo space probe by an Ariane 5 rocket took place successfully on the night from Friday to Saturday. The European launcher gave the first impetus of a long journey. 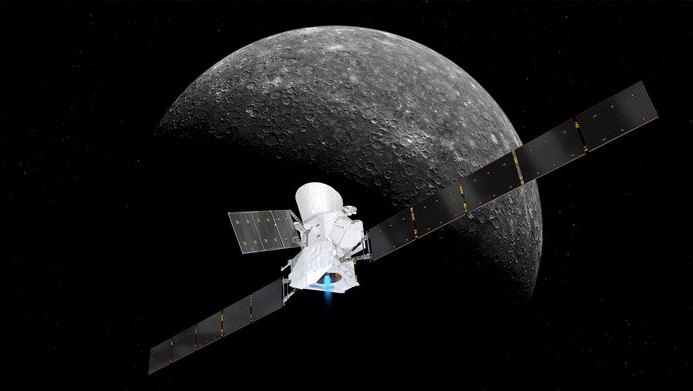 The Euro-Japanese mission BepiColombo flies to Mercury. It may seem like a distant destination, but it will take seven years of travel before BepiColombo enters the orbit of the first planet in the solar system. Indeed, a direct trajectory between the Earth and Mercury would be extremely greedy in propellant. It would be necessary to accelerate the space probe 5.5 kilometers per second from the Earth and especially to slow it by 7 kilometers per second when arriving at the destination. This is impossible without using a huge space probe and an equally imposing launcher. To keep the mission budget under control, the European and Japanese space agencies have decided to use many gravitational assistance maneuvers. BepiColombo will make many passages around the Earth, Venus and Mercury to gradually reduce its speed. Mercury is a planet very hard to reach. That’s why Mercury is a poorly known planet. Before BepiColombo, only one other space mission has managed to put itself in orbit of Mercury, it is the American space probe Messenger. BepiColombo will try to discover why this planet is so dense in comparison with other telluric planets, how an object so small could have kept a magnetic field, or does it contains ice water in its craters that are never exposed to the sun. We will perhaps have a beginning of answer to these questions from the end of 2025. 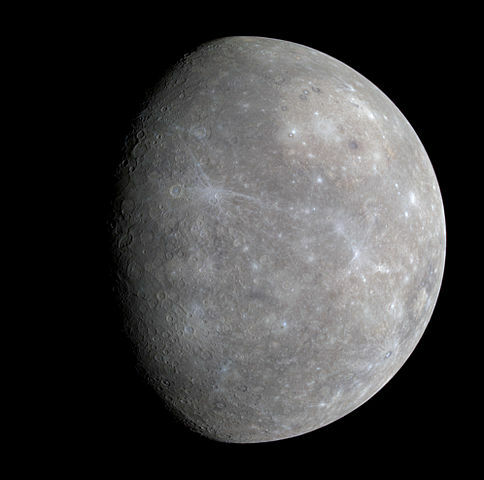 Mercury is the closest planet to our sun. Only two NASA space probes have gone to the exploration of Mercury so far. 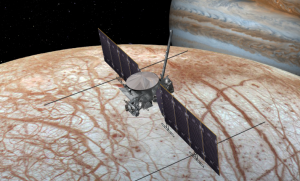 The European Space Agency has unveiled the BepiColombo mission. This mission will be launched in October 2018. The BepiColombo mission is composed of two space probes that will go to Mercury. 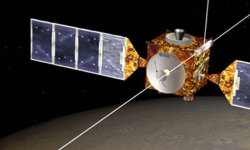 The first, developed by ESA, will be responsible for studying the surface and subsoil atmosphere of the small arid planet, while another orbiter developed by JAXA will be in charge of studying the magnetic field and the exosphere of the planet. The two satellites will go together to Mercury and will separate once in orbit. All elements of the mission have just completed their last test and are ready to go. Although Mercury is not as far away as the gas giants, the trip will still be long : it will take seven years between the launch of the two space probes by an Ariane 5 next year, and their arrival in orbit of Mercury in 2025. The space probe will have to brake considerably so that it can be captured by the gravity of Mercury. A mission to Mercury requires more energy than a mission to Pluto. The setting in orbit around Mercury will be a real feat : BepiColombo will have to perform nine gravitational assistance maneuvers around the Earth, Venus and Mercury before being able to go into orbit. It will be equipped with an ion engine that will operate for a very long time once the space probe will be in orbit. The mission is expected to last a year because the harsh conditions surrounding Mercury could quickly damage the space probe. Indeed, with a temperature of up to 400 degrees, it is a real challenge to operate all the electronic instruments of the mission. A good part of the weight of the space probes will thus consist of heat shields, insulators and heat radiators. Despite of all these difficulties, the exploration of Mercury is essential : it will learn more about our solar system and Mercury is in a same orbit than most of the exoplanets that we discover today. To better understand Mercury is therefore also better to understand these planets.